Our Laser Engraving system is able to mark acrylic, glass and ceramic with truly fine details. 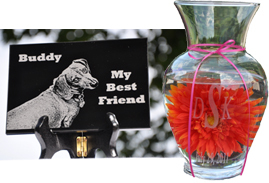 Acrylic engraves and cuts very easily, comes in a wide variety of shapes and sizes, and can be relatively inexpensive. Acrylic comes in two forms cast and extruded. Cast acrylic is used for almost all engraving purposes. This is because the frost produced provides a nice white contrast against the clear material. Extruded acrylic remains clear when engraved but does not produce an adequate contrast. However, extruded acrylic is ideal if you are going to vector cut only. Extruded acrylic is less expensive than cast and also has a lower melting point. The lower melting point produces an edge that looks flame finished when cut. What is the thickness that can be cut in a single pass with the laser is 1⁄8” or ¼”. Glass engraving and etching with a Co2 laser produces a beautiful frosted effect, allowing you to etch custom logos and designs on glass. Logos, text (and just about anything else!) stands out even more as the laser creates a beautiful, frosted effect that makes your engraved design really stand out against the glass background. There are many types of ceramic so the result can vary. Typically there is some material removal from the laser processing ceramic and thus an engraved mark is achieved. In some cases not only the top surface is affected, but also the underlying material. This is more common in commercial grade ceramic items such as earthenware. Industrial ceramics are typically much more heat resistant and have a better quality front surface. Because of the surface condition, engraving is usually of the very highest quality. You can contact us at anytime during your online shopping experience with questions. We are only an email or phone call (603-289-4526) away. We will contact you personally before processing your order to ensure you will be completely satisfied when your order from Precision Laser Engraving, LLC arrives. Your finished product is guaranteed to be unique. We are so sure that we offer a 100% Guarantee on all orders or your money back. We offer shipping via UPS or US Priority Mail. Shipping times vary based on the availability of the item to be engraved, as well as the set-up time required for the engraving.